Welcome to Online Sniper Games! We're put together a collection of the top hand-picked sniping games, all free and no downloads required. Enjoy the sniping games! Slow, steady, and deadly - snipers. You just have to admire them for their instincts and precision when it comes to taking out the enemy. Action movies like "Enemy At The Gate" make one feel like grabbing a sniper rifle, going up to the rooftop of a building, and taking out those menaces to society. BUT that's not going to happen. Not by a long shot. Well, worry NOT! 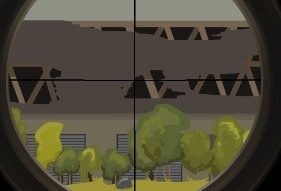 Right here at OnlineSniperGames.org you can be the sniper that you have always wanted to be. With the best online sniper games that we have here, you can train your precision, steady your hands, and hone that killer instinct that everyone fears! Whether you are already a pro at playing sniper games, a newbie, or someone who just wants to get rid of boredom, OnlineSniperGames.org has something that's tailored just for you! So you think you are one of the best snipers out there? Yeah? Cool! Then it's time to put those shooting skills and instincts to the test with our MOST challenging online shooting games. Score high enough and bag truckloads of points - do that and you can post your score on our global scoreboards for everyone to see and recognize. And there's no catch at all! Just hit that registration button (for FREE), sign in, and start conquering the world of Flash sniper games. On the other hand, if you are a newcomer to free sniper games, we have something you will love - OnlineSniperGames.org's Top 10 list! Here, we showcase the best of the best, the cream of the crop when it comes to sniper games on the internet. Just pick one, hit play, and you are guaranteed to have lots of fun looking through that scope, pulling the trigger, taking out enemies, and accomplishing missions. Ridiculously Funny And Ridiculously FUN! So you are looking for an aiming game that is a little light-hearted and silly? NO PROBLEM! You will surely love one of the games on our top 10 list - Panda Tactical Sniper. It has a funny premise for a sniper game. Panda, who is the boss of endangered species crime organization, gets into trouble... ALL THE TIME! And you need to get him out with your tried and tested sniper rifle. You will be heavily rewarded for your services! At the end of the day, it all boils down not so much the substance, but if the game is fun to play. Our games like Counter Snipe and CamperWars Desert Ops brings the thrill of sniping a step closer to reality. The premise in these games are pretty straightforward - take out all of the enemies and advance to the next level. Simple, yeah. BUT here's what: the graphics are engrossing and the music really makes you feel like you are in a sniper movie (we all want that, don't we?). These online sniper games do a good job of keeping that adrenaline rushing, and you will be playing level after level without even noticing it! And we haven't even touched the tip of the iceberg! Here's the bottom line: if you are looking for the best sniper games out there, you are at the RIGHT PLACE - OnlineSniperGames.org has it all. Play now and have fun sniping!